The Museum devoted to the famous architect Antonio Gaudí will have new spaces of virtual reality that will allow visitors to live new immersive experiences so they get closer to the life and legacy of the genius born in Reus. 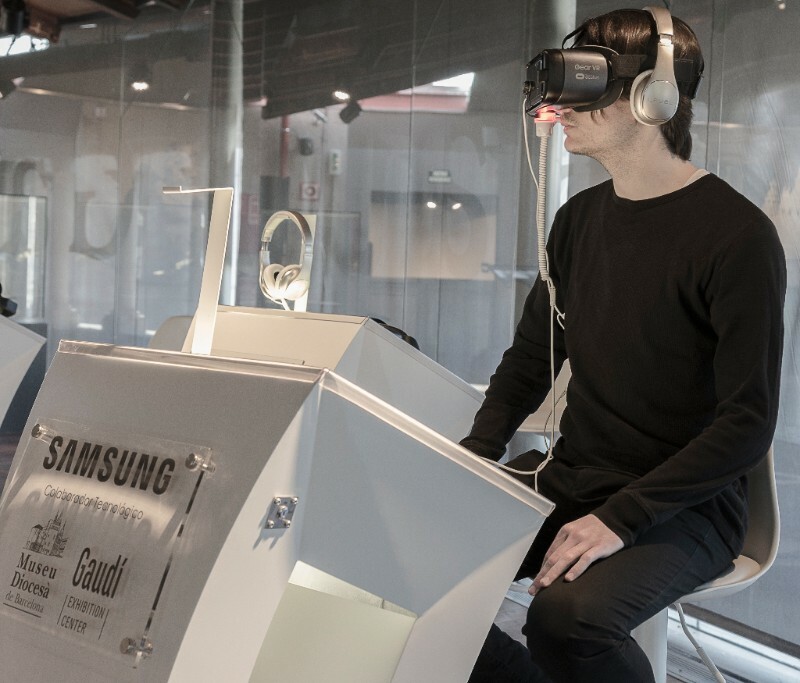 This latest developments come together with Samsung, contributor of the Museum since 2015, offering experiences of virtual reality and the latest technology. One of the major contributions to the exhibition space Gaudí Exhibition Center, and one of its most remarkable lures is the possibility of knowing the life and work of the Catalonian architect in virtual reality. 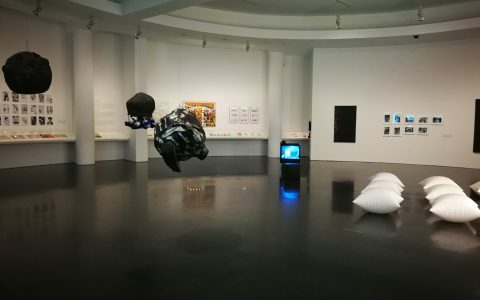 Thus, Samsung, the technological contributor of the Museum since 2015, will equip to the space three new places with Samsung devices (Galaxy S8, Gear VR and headphones) and will renew its media content, allowing visitors to go into and first-and knowing the legacy of this inimitable architect. The digital content of the museum has been renewed with 360º pictures of the Crypt, Güell Colony, Gaudí Museum, Milà House, Bellesguard House, Parque Güell Park or Vicens House. Also it has been created an animation in virtual reality that explains in a singular way the life of Antoni Gaudí. 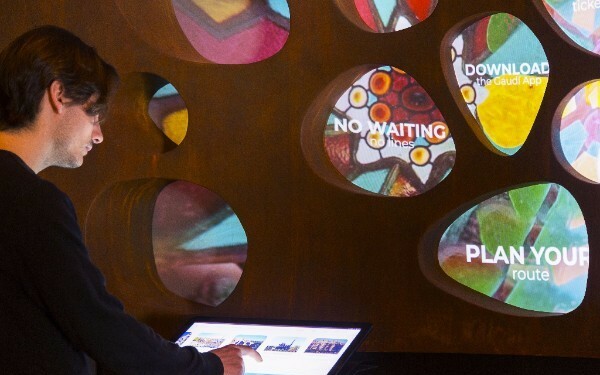 Apart from this new contents, the Museum will have new Galaxy View Tabs that are part of the tour that travel the visitor, in such a way to create a more technological and interactive space. Like a technological adviser and partner of this Museum, Samsung has equip during these years the exhibition Paseando con Gaudí with the latest LFD technology, for a wide format, Video Wall solutions, augmented reality technology and interactive contents for the APP with media guides installed in Tabs that the people use. Another of the new created projects is an application of inquiries installed in the Museum, so visitors can be informed about how to plan their trip of Gaudí in Barcelona and will allow them benefit of ticket purchase discounts of the Gaudí buildings or purchase in advance. In a clear homage to the distinctive work of the Catalonian genius, Samsung wants to allow its users to use its devices with the Antoni Gaudí’s work. Thus, Samsung presents new areas for its wearables Gear S2, S3 and Sport based in the ways and colors of the stained glass which the Catalonian genius of modernism festooned his mythical pieces. 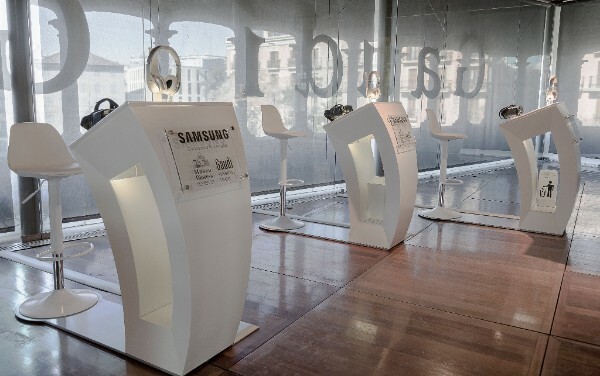 Apart from his clocks, Samsung and the Museum as well present for smart phones inspired in the work of the Catalonian artist with images of the architect’s Casa Batlló. Gaudí Exhibition Center is the start point of the Gaudí’s tour. To know the personality and work of the most universal architect and to understand his brilliance, it is essential to visit the exhibition “Paseando con Gaudí”, a whole collection that allows to discover his huge creative skills, the great imagination and the revolutionary ideas that turned him into the genius of all geniuses. The exhibition space, opened on September, 2015, is located in the emblematic building Pia Almonia, in the middle of Gothic quarter. Consist of 3,280 ft. over three floors. With a financing 100% private, it is a project of Molines Patrimonis, thanks to the partnership agreement with the Museu Diocesà in Barcelona, ​​and the scientific advice of The Gaudí Research Institute and the technological support of Samsung. The exhibition gathers original pieces, objects and documents. It counts with 20 models, replicas and sceneries and more than 150 linear meters of showcases and exhibition supports. The audiovisuals, the interactive contents, the media spaces and virtual reality set off a visit that makes us live an innovating experience technologically speaking. It is an unique exhibition in the whole world that place value on one of the greatest architects and creators of our heritage. It is a quite an experience that helps to enjoy better a visit to Barcelona city and his most emblematic pieces.